But now, let’s track this story back about 2 years…. At the start of 2009, Todd Woody, the Green Wombat blogger for Fortune Magazine, wrote that wind jobs had outstripped the coal industry. 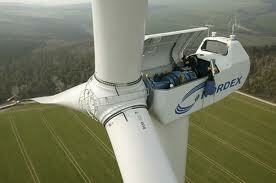 He based it on the American Wind Energy Association’s report that wind jobs had increased to 85,000 in 2008—a 70% jump. According to the Department of Energy, coal jobs came in at about 81,000. To many, this simple observation seemed to be a historic turning point. The story took off. But the assertion turned out to be bogus—that’s the word Eoin O’Carroll, the Christian Science Monitor’s BrightGreen blogger used. The comparison was apples to oranges. The coal number was miners only, while the wind jobs included everyone directly and indirectly employed, from manufacturing and installation to legal and marketing consultants. Done right, the comparison should have been about 85,000 wind jobs to 174,000 coal jobs. But take a step back and a more interesting picture emerges. Coal jobs have been declining for decades due to technological developments and rising labor costs. Wind energy’s growth curve has been bumpy, to say the least–but growing. In 2008, new wind generating capacity in the U.S. equaled the output of fourteen good-sized coal-fired plants. People started talking about the American West as the Saudi Arabia of Wind Energy. So I decided to ask one simple question: what if you add wind and solar jobs together? How does the renewable energy industry, more broadly defined, compare to the coal production? The Solar Foundation’s most recent jobs report says there were 93,500 solar workers in the U.S. as of mid-year 2010. Add that to the 85,000 wind sector jobs and you get a total of 178,500 renewable energy jobs. Which edges out coal—and we haven’t even considered the new generation of nuclear energy, or the nascent tidal power industry. Coal will be with us for a while, and a post at Coalblog.org from the American Coal Council, assures us that the coal industry is not opposed to the development of renewable energy. 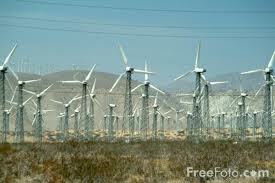 After all, wind turbines all over the world are made with steel from coal-fired plants. But consider this: the average age of coal plant workers in the U.S. is reported to be 48. The average age of coal miners in West Virginia is 55. If you (or your children) had any kind of choice at all, which industry would you choose? This entry was posted in Climate change + Culture, Deep Ecology, John Wackman blog and tagged American Wind Energy Association, Coalblog.org, Green Wombat, Solar Energy Industry Association, Solar Foundation, Steven Mufson, Todd Woody. Bookmark the permalink.